LINCOLN LOG CABIN (Hagerman Lake): Snowmobile from the property! 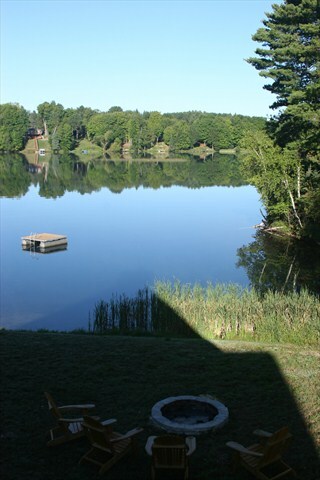 Sleeps 8, Pet friendly, Ski Brule just 10 min away! 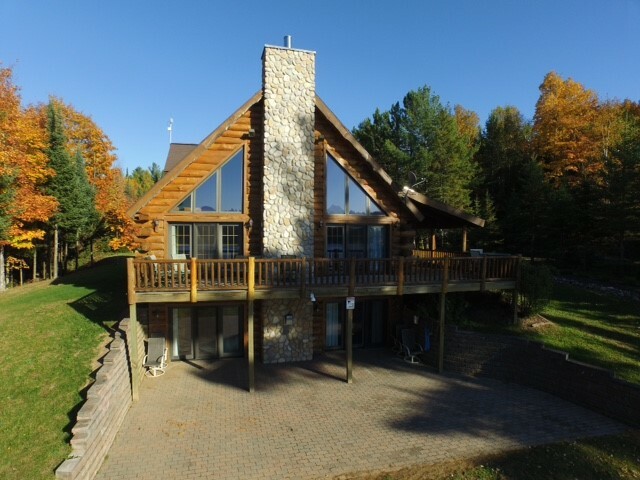 This luxurious log home is located in the midst of Ottawa National Forest, on the shore of a crystal clear spring fed lake, just outside the small town of Iron River, Michigan. Hagerman Lake as it is called, named after the original owners of the surrounding property, is an excellent fishing lake both summer and winter.It has been highlighted in Field and Stream magazine for its record Northern catches. It is home to a family of Bald Eagles. Frequent sightings of the state bird, the Loon are made on the lake. A giant Woodpecker loves to awaken you some mornings with its rat-tat. If you get up during the night, make a point to go outside and check out the aurora borealis, a frequent sight in the night sky of the U. P. There is a fire pit in the yard lakeside to enjoy day or night, and ample wood is provided. Well marked cross-country trails adjoin the property that is great for hiking and backpacking in the summer and cross-country skiing in the winter. As an added bonus, it is located in the heart of snowmobile country. Trail rides abound in every direction. Ice Fishing and Snowshoeing too! 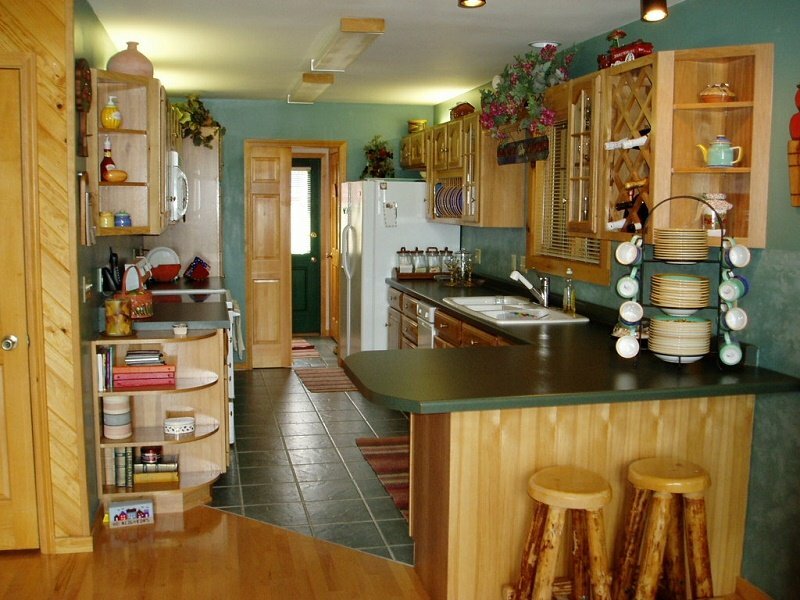 The home itself is a spacious 3600 square foot year round vacation home with all the amenities. It has a beautiful wraparound deck, great for barbecuing, reading and relaxing. It is steps away from swimming and boating. 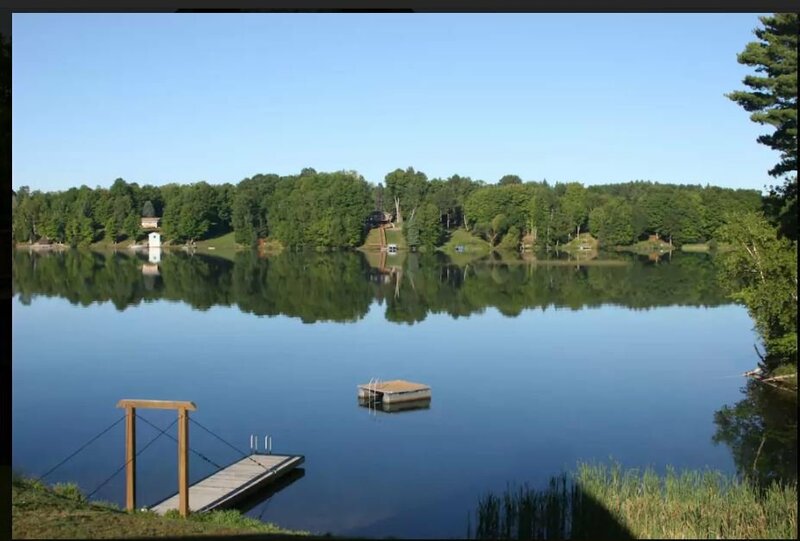 There are docks and canoes for easy access to the lake. There is a great recreation room downstairs that has a TV with satellite (all the premium channels). There is an air hockey and foosball table for game enthusiasts. The ground floor has radiant heat floors. The great room on the main floor has a wood burning fireplace to add that extra coziness and warmth in the fall and winter.There is also a dining room table that seats 8, or once the leaves are added can seat up to 12. The house has three master bedrooms with adjoining baths. The main floor bedroom has a Jacuzzi bathtub and steam shower. 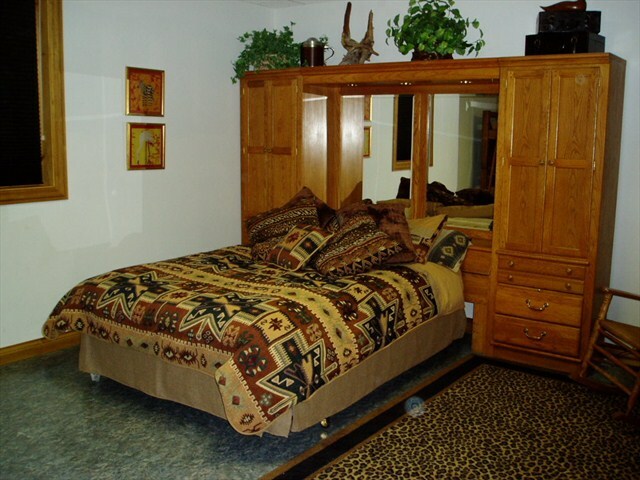 They are all charmingly decorated and come fully stocked with bedding and towels. They are each on separate levels so afford complete privacy for two or three couples vacationing together. Since your comfort and satisfaction is of upmost important to us, we can not accept bookings of more than 8 total people (including children) at the cabin. As an extra layer of security, we do have video cameras in the back and front of the cottage. There are no cameras inside the cottage. *While there is comfortable sleeping in beds for up to 11 people, 8 people are ideal. 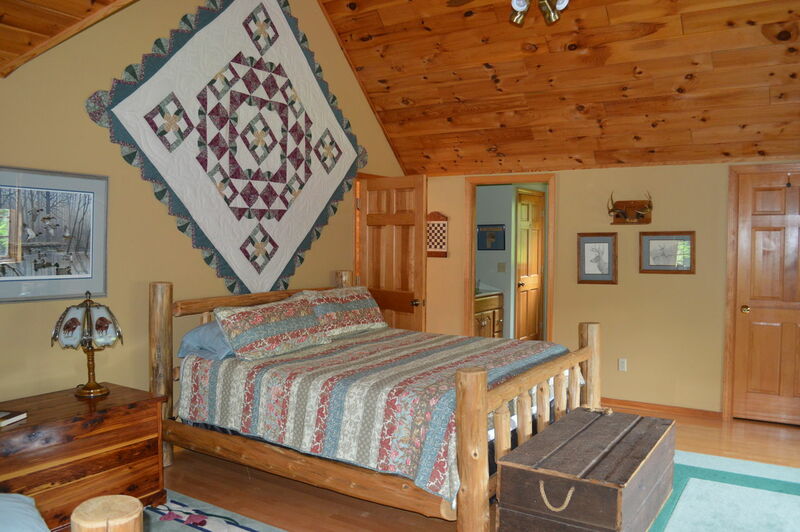 Lower Level Suite- 1 Queen Bed + 2 Twin bunk beds (stacked) with an additional trundle bed. Cross-country ski trails/Hiking trails: next to the property, be adventurous following the well-marked cross trails all year round. Air Conditioning: One of the few vacation rentals in the Upper Peninsula that actually has air conditioning, even though it it is rarely needed. Still, it sure feels good to turn it on during one of those hot summer days. 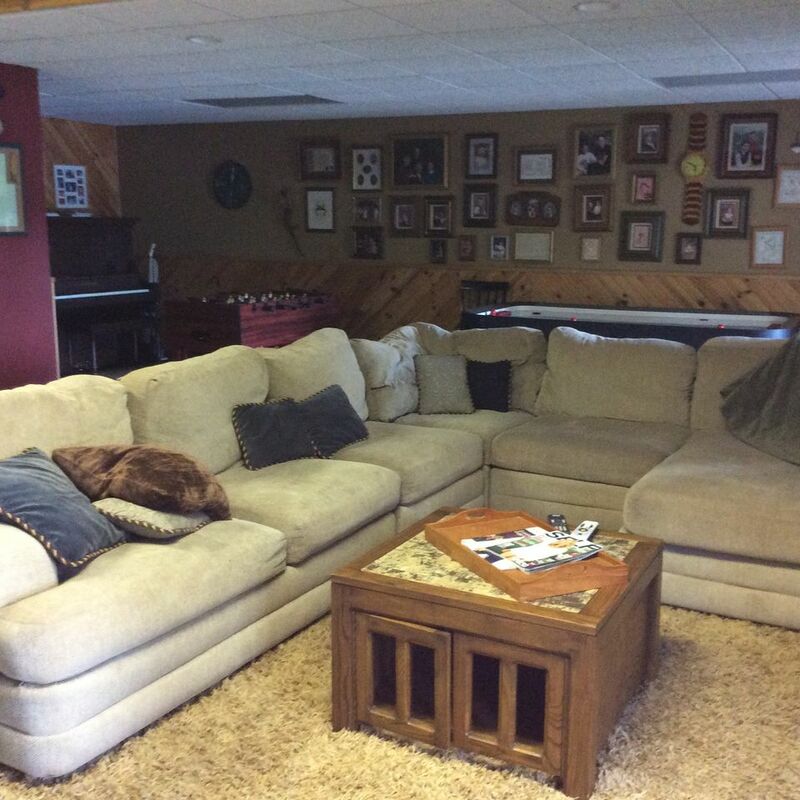 Basement: The comfortable basement is great for relaxing and watching the beautiful lake. Also, as returning guests may remember, we used to have a pool table, but have replaced it with a foosball table and air hockey. Boats: We currently (as of 2017) have 1 canoe and 1 small rowboat as well as 2 new kayaks for your use. We do have some life jackets available, yet we would advise you to bring you own. Life jackets are required for each person on the boat. No exceptions. If you have children, you must bring their own life jacket, as life jackets vary by size for the little ones. Boat Launch: On the opposite side of the lake there is a small public park and boat launch on Hagerman Lake Road that you are able to use. Cell phone service: Cell phone service is generally unreliable in the Upper Peninsula when you travel outside of Marquette and Escanaba. Therefore, we have a land line at the cabin with local and long distance service. Children: We do have a pack n play available for young children. Plus, we do have a child gate you are welcome to use for one of the staircases. Dishwasher: Please note, there is no dishwasher. The picture that appears to be a dishwasher is actually a compactor. 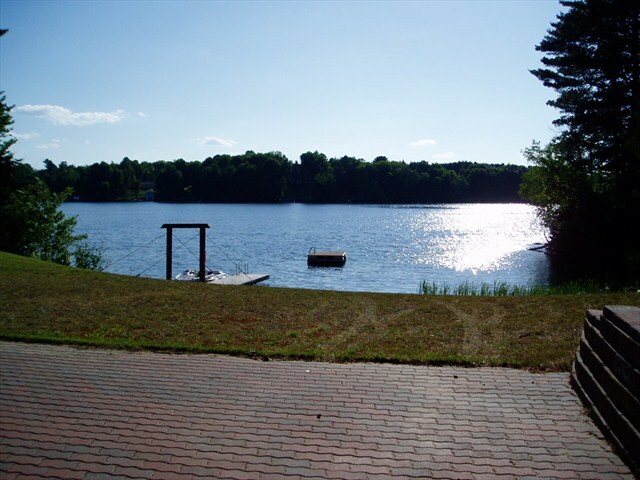 Dock: The dock at the cabin is 20 foot long. It is about 4 1/2 deep at the end. Fire pit/Firewood: There is a fire pit for your use and do provide you with firewood for fireplace and fire pit. Fishing: Yes, bring your fishing pole and enjoy excellent summer fishing with a right from the dock or with the simple fishing boat we provide. In the winter, you can bring your own ice shanty, or go out onto the ice with your auger to enjoy some great fishing on the secluded Hagerman Lake. Enjoy northern pike, blue gill, walleye and small mouth bass. It's a spring fed lake. Blue gill are found right around the dock in the summer. One guest even caught 100 blue gills in one day. Golfing: Golfing in Iron River is first class with its two elegant golf courses. A person could golf for days, enjoying the beautiful terrain the courses are located on. With George Young's Championship 18-hole Golf Course and the Iron River Country Club, you'll be golfing all day. Grill: Yes, there is a propane grill for your use. 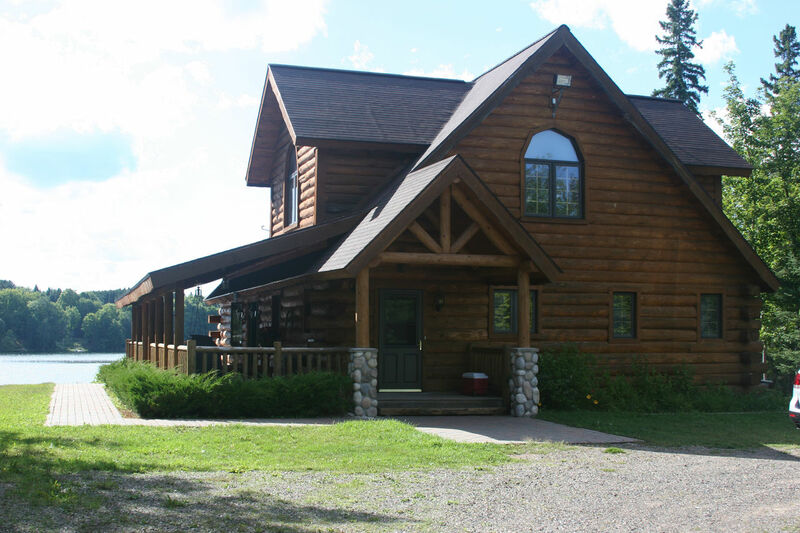 Hospital/ Medical Care: The closest hospital is in Iron River, about 5-6 miles from the cottage. There is also a clinic in the shopping center by the grocery store. Hot Tub (No-Sorry): Once upon a time there was hot tub at the cabin. It was laid to rest last year. Still, we do have a Jacuzzi tub in the bathroom so you can enjoy those relaxing jets. Internet: YES, Wi-Fi is here! Enjoy! !5GB available weekly. Any excessive use over the 15 GB will be billed to you as extra cost. Kitchen Supplies: All basic kitchen pots/pans, dishes and cooking utensils are included. Though we don't currently have a dishwasher, the garbage disposal is a wonderful asset. We also have a new stove and refrigerator. Pets: *Pets are welcome! Freshwater Vacation Rentals currently charges $50/per pet. Skiing (downhill): Ski Brule is just 10 miles away- 397 Brule Mountain Road- Iron River, MI 49935. You can cross-country ski right from the cabin door. Snowmobile Trails: You can snowmobile right from the cabin door. Please bring your own snowmobile! Swimming beach: While it is possible to swim directly from the lakeshore in front of the cabin, the best traditional swimming beach is just across the lake. Feel free to row across, attach your own motor onto the boat or drive the 3 miles around the lake to the beach. There is a nice park there as well. Gravel bottom in front of cottage. TV: We have a TV with cable at the cottage. Watersports: Hagerman Lake is an all-sports lake. It was my husband, two dogs, and myself...so this cabin was a lot more space than we needed, but it was perfect for a long weekend. I contacted the rental company mid-stay regarding some items of concern and they (and the owner) were super responsive to my concerns. Great cabin and awesome rental company! I would recommend. The owner has a bunch of cut wood at the cabin for the fireplace, with a wood splitter on the front porch to get smaller pieces. This saved us the hassle from having to go into town to find wood. Definitely appreciated! FYI - they are right, your GPS is not to be trusted when getting close to this property (coming from southern WI anyway). Jessica, thank you for this great review and for the kudoos to FVR. It is our highest priority to make our guest's visit the best possible. 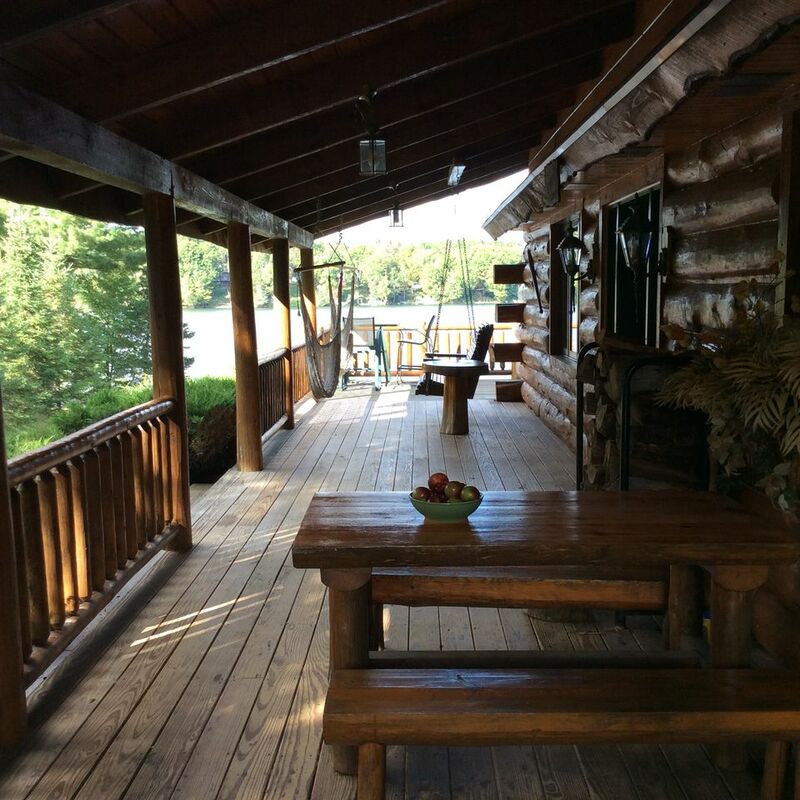 We are so glad that you, your husband and your pups had such a great stay at Lincoln Log Cabin. It is a great winter property. We hope to work with you again in the future! This is one of our favorite cabins and we'll definitely be back! Ken, the best reviews come from our returning guests, so we really appreciate your taking the time to write a review. 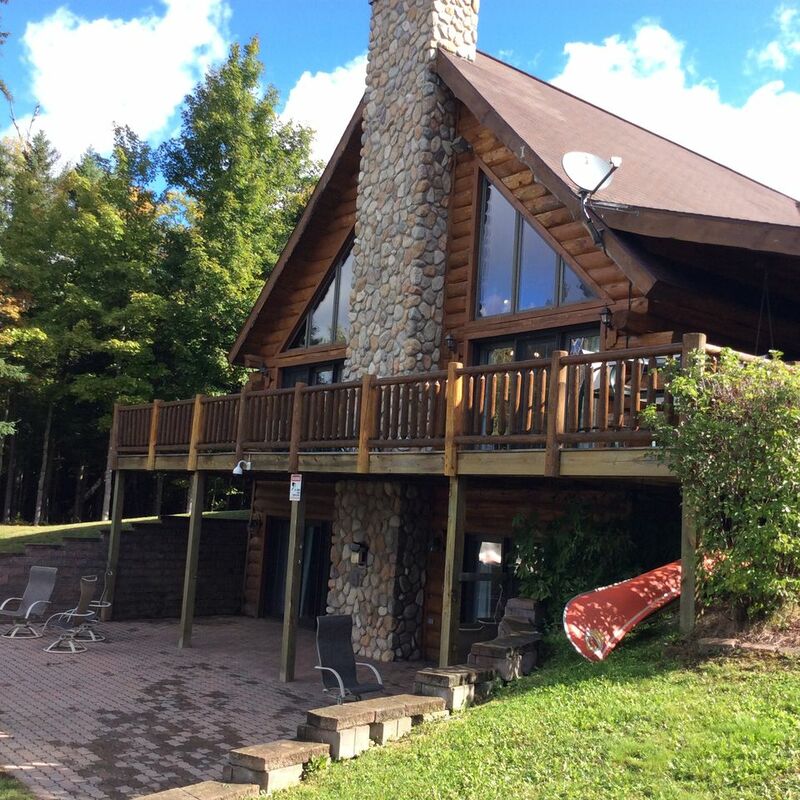 Lincoln Log Cabin is a great property. The stone fireplace, the windows, the view of the lake, the porch and the privacy all combine to make it a great vacation spot. We are so glad that you came back and we look forward to seeing you again! 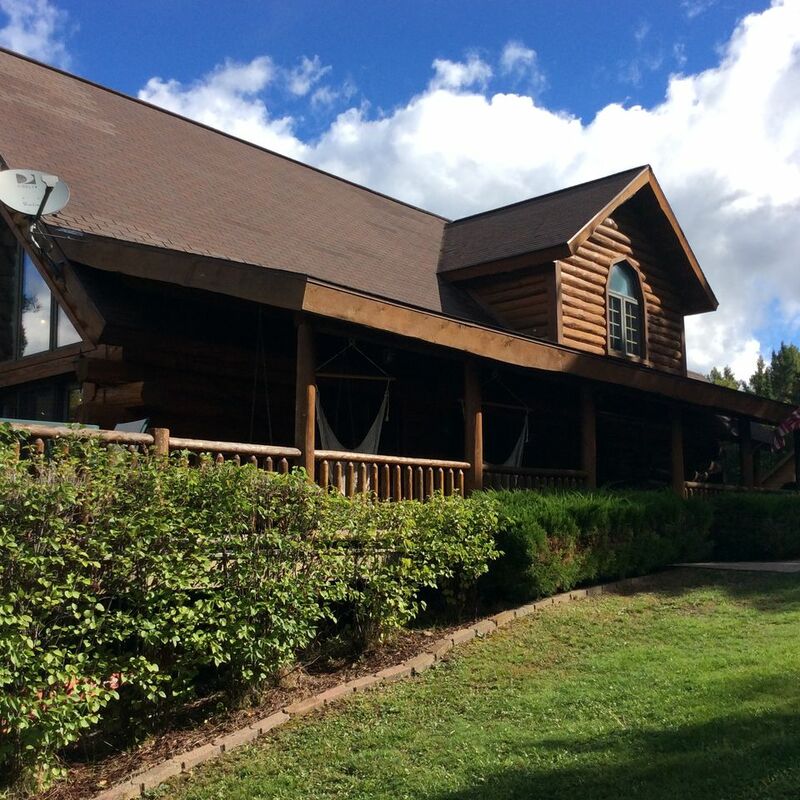 We loved our stay at the Lincoln Log Cabin! I'm sure it shines in the summer, but for us, the cabin made for a perfect winter retreat over the holidays. Coming from Chicago, we were looking for a change of pace, and that's exactly what we found. The property is nestled in the woods with lots of peace and quiet. But it was only a short drive to Iron River, where we made daily trips for tasty meals and visits to a very nice grocery store. Inside, the entire cabin has a cozy feel even though there was lots of room for everyone to stretch out and find their own space. 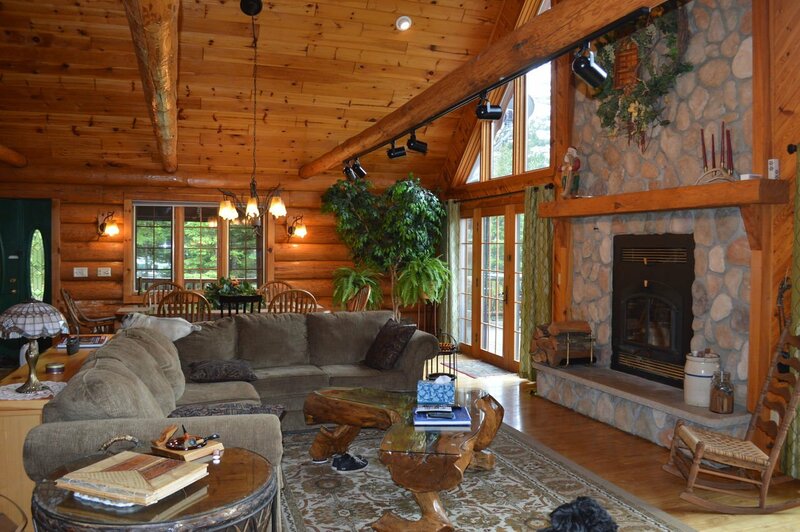 We spent most of our time in the great room, reading by the fire or sitting at the dining table with views of the lake. The bedrooms were big and comfy too. The service we received surrounding our stay was fantastic. Cara from Freshwater was prompt and friendly--not only answering my questions but offering great tips about places to eat near the cabin. After we arrived, the owner of the property called to make sure I had everything I needed. It was a really pleasant experience all around. We are hoping to get back to the Lincoln Log Cabin again soon! John, getting reviews such as yours makes our day! 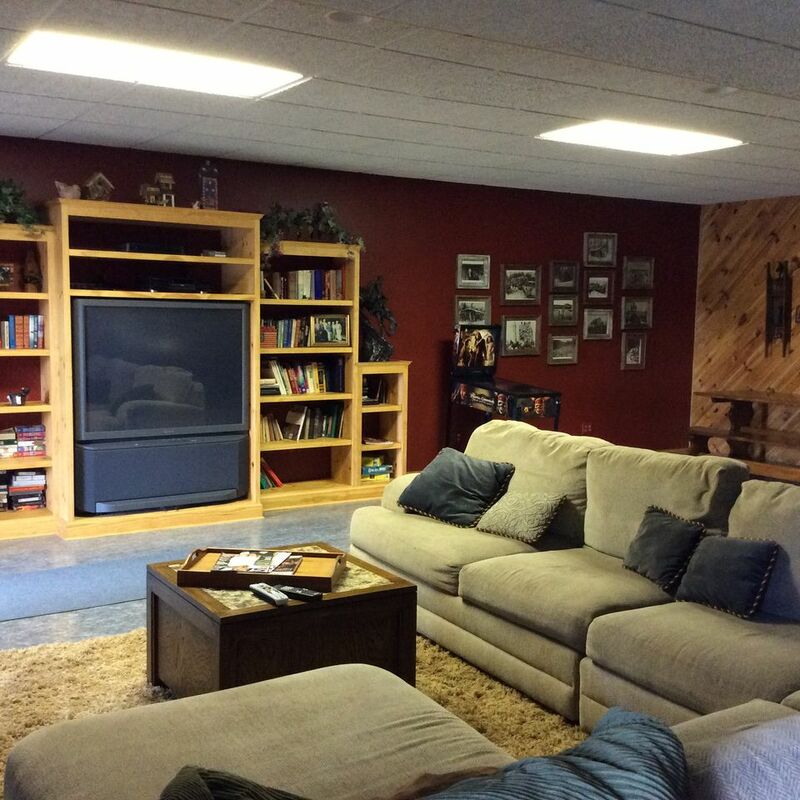 We are so happy that Lincoln Log Cabin was the perfect place for your group. There is something totally magical about being in the woods in winter, tucked into a comfortable cabin with a huge stone fireplace and a light, open floor plan. It's the perfect place for dreaming, reading and conversing and outdoor winter sports if that's your thing. We look forward to working with you again! This is the 2nd time we have rented this cabin. It is so beautiful, clean and has everything you need. I highly recommend the Lincoln Log cabin. We stayed for Christmas both trips and they had the cabin decorated for us and even had a Christmas tree. The cabin is really close to Ski Bruel and Caspian sledding hill. We had so much fun. On our next trip up I would like to visit and stay at the cabin in the summer. Thanks again for the wonderful stay! Jody, thanks for this great review! Our return guests are our best advertising. 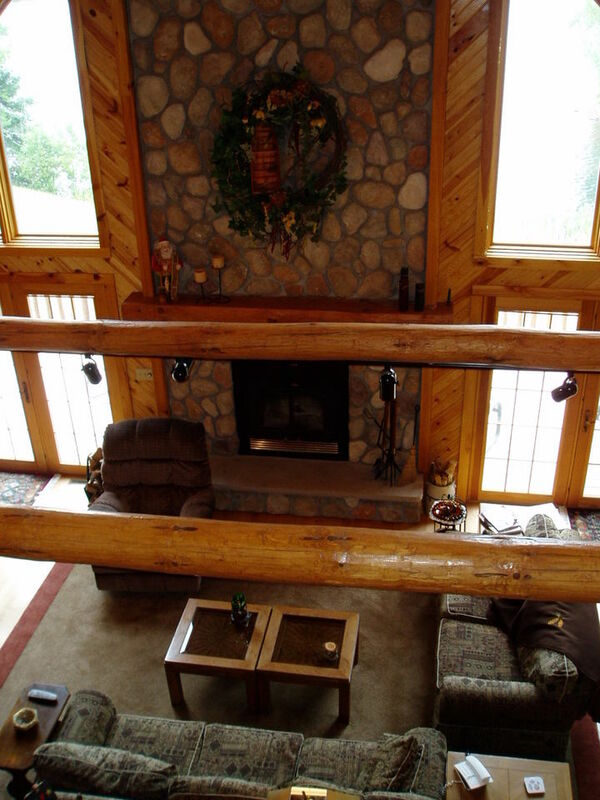 Lincoln Log Cabin is a great vacation spot any time of year, and going there for Christmas was brilliant! The incredible stone fireplace must have helped to make everything even more merry and bright! Do come this summer, so you can experience the pleasure of Lincoln Log Cabin in the warm months. John and Debra, we love that you come back to the Lincoln Log Cabin every year! You are the perfect guests. 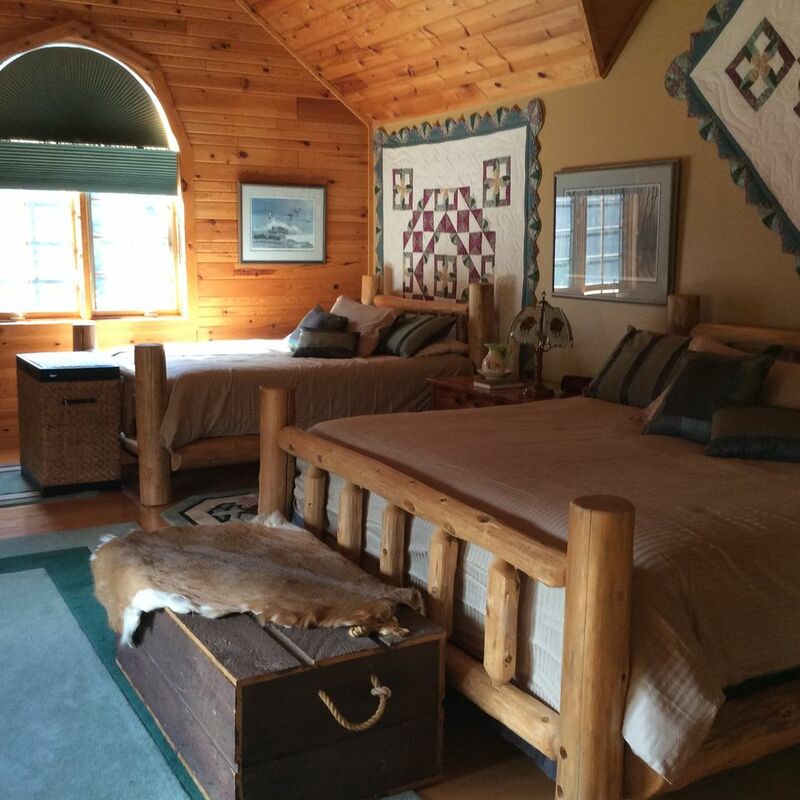 John and Debra, we are so happy that you love Lincoln Log Cabin as much as we do. We'll look forward to seeing you again next year! Very awesome rental! Say to see it's almost fully booked for next summer. We are so happy that you enjoyed your stay. 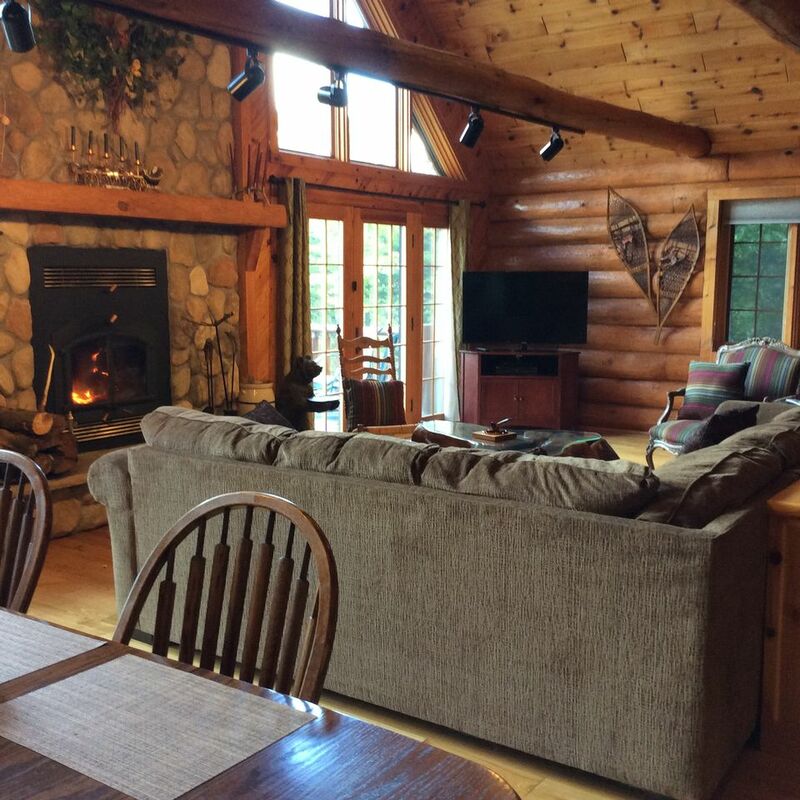 The Lincoln Log Cabin is a wonderful property. Remember that we have over 70 properties in Michigan, and we offer a 10% discount for returning guests who book directly through us. The cabin was great and we really enjoyed our stay. The rental process was convenient and the information provided was efficient and helpful. I will use this method of booking again. We are so happy that you had a positive experience. We have over 70 properties for you to choose from, and we give a 10% returning guest discount when you book directly through us. We hope to see you again soon. We thoroughly enjoyed our stay at the Lincoln Log Cabin. The spacious, beautiful and relaxing atmosphere was exactly what we were hoping form. Thank you for sharing this beautiful place with us for a couple of days. This is a definite place to return to! 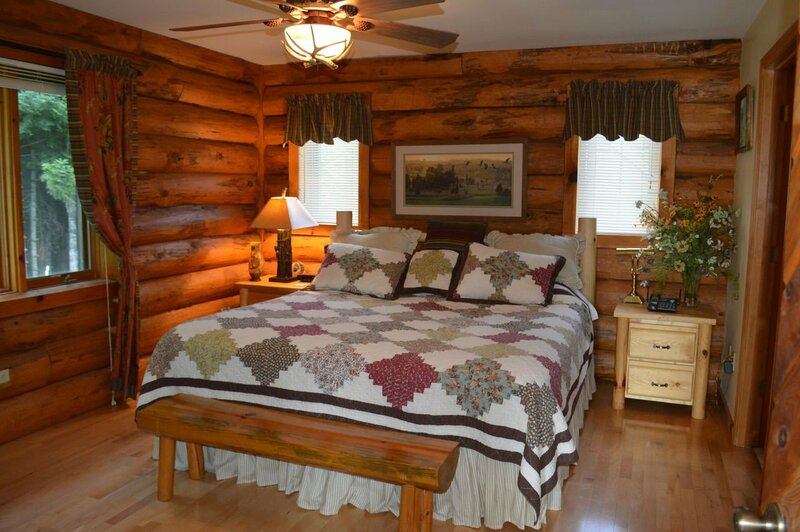 We are so happy to hear that you enjoyed your stay at the Lincoln Log Cabin. It is a great property. We hope to see you again in the future.